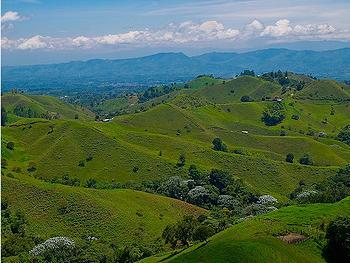 BOGOTÁ, Colombia, March 5, 2012 (ENS) – Colombia’s Council of State has ordered a halt to exploration for oil and gas in the country’s Quindío region, which has been declared part of the UNESCO World Heritage Coffee Cultural Landscape. The region produces some of the world’s highest quality coffee. Issued last week, the government decree requires the suspension of all exploration by the National Agency of Hydrocarbons and the Drilling 2010 consortium in the Quindío region, an exploration project which covers a large area. Presented by Quindío’s Office of the Ombudsman, the decree supports the concerns of many of the region’s landowners regarding land access. The landowners also fear that environmental deterioration could result the proposed drilling of 15 meter (50 foot) deep holes and insertion of an explosive product, Sismigel Plus. The project is on hold awaiting a statement by the Colombian government. In the western central region of the country, crossed by the Andes mountains the Quindío region lies in the center of a triangle formed by Colombia’s three main cities – Bogotá, Medellín and Cali. The region is one of the most important producers of Colombian coffee. The department belongs to the Colombian Coffee-Growers Axis, which is the center of production and export of the highest quality coffee in Colombia. The World Heritage property reflects a 100-year-old tradition of coffee growing in small plots in the high forest and the way farmers have adapted cultivation to difficult mountain conditions. It encompasses six farming landscapes, which include 18 urban centers on the foothills of the western and central ranges of the Cordillera de los Andes situated on the relatively flat tops of hills above sloping coffee fields. 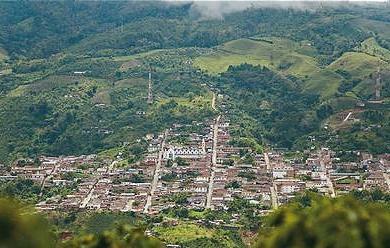 Quindío is the natural habitat of 520 species of birds and about 60 species of mammals, many found nowhere else on Earth. The area has the largest number of heliconia species in the world and a large number of orchid species. But the cloud forest is descreasing due to agricultural activities pushing many of the endemic species toward extinction, including the yellow-eared parrot and the rare Colombia weasel. Still, Colombia is on a path to increase “sustainable” oil and gas production Minister of Mines and Energy Mauricio Cardenas said February 21. “We’ve had an oil boom in the past that was flower of a single day. Colombia now wishes to maintain a production level of over one million barrels, but in a sustainable manner for decades, said Cardenas. The main actors in the Colombian oil industry and the world, will meet March 13-15 at an oil and gas conference and exhibition in the city of Cartagena. The technical agenda will include growth in production in Colombia, social responsibility and investment.